It is estimated that nearly 10 million people visit the Smoky Mountains each year, which is the highest visitation of any of the nation's national parks. This city of nearly 400 residents sits at the entrance to the Great Smoky Mountains National Park and is known as the "Peaceful Side of the Smokies. The city offers a variety of recreational opportunities including bike trails, the hiking trails in the National Park, golf, and swimming at a popular stretch of the Little River known as the Townsend "Y." Maryville was named in honor of William Blount's wife, Mary Grainger Blount. It was established in 1790, but the first settlement of the area began in 1785 with settlers who came primarily from Virginia. Parks are located throughout the city and include an eight-mile fitness and bike trail interwoven through downtown and designed to link Alcoa's Springbrook Park and Maryville's Sandy Spring Park. The James Gillespie House is located in Louisville and is listed on the National Register of Historic Places. The house, built between 1800 and 1824, is known for it's Federalist architecture and engineering. Friendsville is home to Mister Station Store and People's Bank of Friendsville, which are both listed on the National Register of Historic Places and are known for their architectural significance. This Smoky Mountains town in eastern Tennessee attracts nature-loving retirees. Located in the foothills of eastern Tennessee's Smoky Mountains, Maryville's greatest asset is its desirable location. One is greeted daily by gorgeous vistas of rolling, velvety slopes. A slower pace, small liberal arts college and abundance of outdoor recre�ation further add to the appeal of this quiet town of 25,000. The area has a low cost of living and taxes that are among the lowest in the country. Recreational activities are plentiful throughout Blount County. Bicycling along lightly traveled roads is such an accepted sport that the chamber of commerce offers a brochure with detailed descriptions of routes covering more than 100 miles. For hiking, there are more than 125 miles of designated trails, including Greenbelt Park's two-mile lighted fitness trail and exercise course in the center of Maryville. To the south there is white-water raft�ing on the Nantahala and Ocoee rivers, and about 40 miles to the east is the Ober Gatlinburg Ski Resort. Maryville is off the major highways, preventing heavy traffic flowing through town. (From downtown Maryville, it is 17 miles to the Interstate and 22 miles to Interstate 75. This helped Maryville retain a peaceful safe atmosphere. There are housing options in Maryville for those not looking for gated, planned communities. Smaller homes in town, around 1,200 square feet, range from about $89,000 to $129,000, or $79,000 to $119,000 in the county. Five-acre tracts in the suburbs can be purchased for about $150,000 up to $675,000 for a mountain or lake-view site. Slightly smaller four-acre tracts start at $30,000 to $150,000 with most available in the $70,000s. A pretty, short drive south of Maryville, Laurel Valley, the 1,600-acre planned residential develop�ment backs up to Great Smoky Moun�tains National Park. There are 370 home sites ranging in size from quarter-acre lots to 12-acre tracts. About 350 homes have been constructed, with prices ranging from $120,000 to $1 million. Laurel Valley offers a clubhouse, pool, restaurant and 18-hole golf course. Lakes Fort Loudoun, Tellico and Chil�howee and the Tennessee and Little Ten�nessee rivers form a semicircle to the west of Maryville. Sailboats, canoes, houseboats and cruisers ply these waters in search of fish, waterfowl and spectac�ular scenery. Health-care needs are met by 128 medical doctors and 464 regis�tered nurses practicing in 334-bed Blount County Memorial Hospital. The hospital is equipped for all medical emergencies except neurological and cardiac surgery. In Knoxville there are more than 2.500 practitioners of every medical specialty and subspecialty. 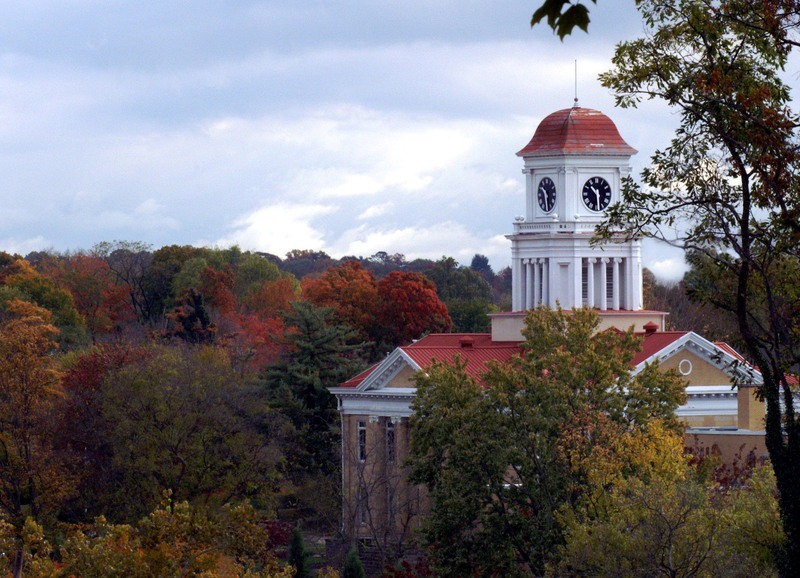 In the center of town stands the quiet, tree-lined campus of Maryville College. The 370-acre campus has 20 major buildings, including several listed on the National Register of Historic Places. With an enrollment of 1,150, this small college contributes to the town's quality of life without dominating its pace and rhythms. The college�s 1,200-seat Wilson Chapel and 400-seat Maryville College Playhouse theater offer orchestral and choral con�certs and theatrical productions. Art gallery exhibits. the school's Appalachian Ballet Company and Division III NCAA athletic events add to the mix of activities available to the community through the college. There's also a series of non-cred�it courses designed for seniors. The musically talented can play their instrument by trying out for the Maryville-Alcoa College Community Orchestra. Made up of college musicians and residents of Maryville and nearby Alcoa, the orchestra performs six con�certs a year. Festivals are among the favorite rites of spring and fall in Maryville, and promote an appreciation of the great outdoors. In April, the Appaia Wildflower Celebration features tours, bird-watching walks, wildflower hikes and wildlife programs. At the end of the month, the eight-day Smokies Spring Festival offers music and the expected beauty of the Great Smoky Mountains. The Autumn Harvest Crafts Fair in October entertains the crowds who come to see the changing colors that ushers in the fall season. Civic organizations, many sponsored by the chamber of commerce, make impact on the social, cultural and economic life of Maryville. Beautiful Blau a group involved in beautification, recycling and litter education, Blount County Partnership, a cooperative effort of four organizations, among two dozen groups in town work toward community improve Retirees work alongside civic leaders recruit new industry, promote toll support education and develop philanthropic projects. 7.25% on groceries, 8.25% on other tangible personal property unless specifically exempted. Sales tax exemptions on prescription drugs, professional services, hearing aids, prostetic devices. Social Security benefits and private and government pensions are exempt. The first $1250 (2500 on a joint return) of taxable income is exempt, and individuals 65 or older with total annual income of $16,200 or less ($27,000 for joint filers) are exempt from the tax. $2.27 per $100 of assessed value in Maryville, $2.43 per $100 in Blount County, with homes assessed at 25% of market value. Early tax on a $200,000 home in the city is about $1135. Yearly tax on a $155,000 home is about $942. A reduced rate is available to homeowners who are 65 and older. There are 219 Protestant and two Catholic churches in Blount County. Maryville College is a liberal arts institution offering baccalaureate degrees in over 35 majors. Pellissippi State Technical Community College has a campus in Blount County, and the University of Tennessee in Knoxville is about 30 minutes away. Blount Memorial Hospital is a 334 bed acute care facility with a trauma center equipped for all medical emergencies except neurological surgery. Eight hospitals and medical centers in Knoxville include the University of Tennessee Medical Center, a full service facility with a trauma center and complete range of specialties.